The whispers of an impending global recession can no more be hushed away. The economy certainly doesn’t give any rosy impression of job market. Perhaps no other place can show a better picture of the harsh reality than the campus of a B-School. However, the PPO converts of IMT Ghaziabad this year have an altogether different story to tell, as the number of converts has seen an increase in comparison to the figures of last year. The batch of 2017 has brought quite an impressive statistics of pre-placement offers to the institute that has been provided below. Mr. Goyal also says that the specific courses that are being offered at IMT Ghaziabad facilitated by the tie up with firms such as Genpact trains the students for specific sectors. The lingering pessimism because of recession in the recruitment figures globally has not affected the trend of pre-placement offers because recruiters realize the value of investment in long term relationship with premier institutes. In fact, the number of pre-placement offers has seen a significant growth this year in comparison to last year. 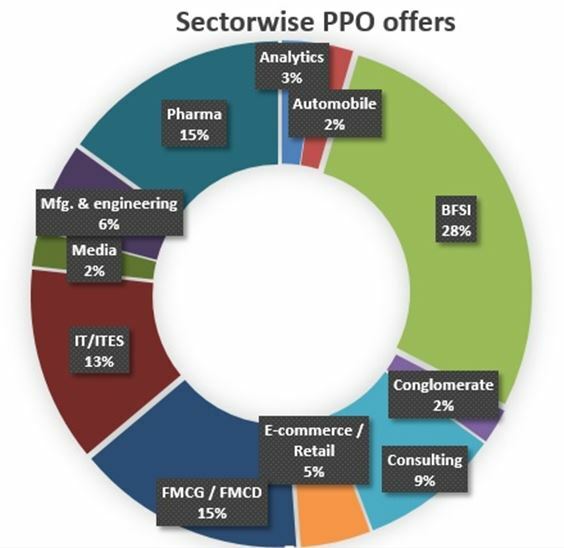 A sector wise breakup of the PPOs received so far has been provided below.